(APN) ATLANTA — On Monday, February 20, 2017, which is also President’s Day federal holiday, thousands protested Trump’s policies with “Not My President ” rallies in cities across the country, including Atlanta. They walked on the sidewalk and patiently waited at crosswalks for a green light to not block the traffic flow. Car horns blew continually in support of the marchers during the long three-hour march. “We are here to unite the different groups in Atlanta and try to put them in one march against Trump on President’s Day. 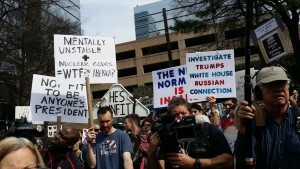 We don’t consider him our president because it’s questionable on how he got into office,” Ray Dafrico with Democratic Spring told Atlanta Progressive News. “We have lots of questions about his business in other countries and the Russians hacking into the election. Hopefully, more information will come out and he will be impeachable,” Dafrico said. The anger and energy of ordinary people–many of whom have never participated in a protest before–is increasing in the streets and town hall meetings even in deep red states. Many people new to social protest expressed outrage about Trump’s authoritarian tendencies and regal lifestyle that he lives while cutting social programs, which especially hurts children and poor families. Secret Service security for the Trump family is costing taxpayers around 12 million dollars per month, compared to the Obama administration’s security, that only cost 12 million annually. The Secret Service follows Trump’s sons as they jet around the world making deals and attending grand openings of Trump-brand golf resorts. “They should pay for it themselves if they want to operate a very expensive home in New York for Melania. Why should we subsidize their extravagant lifestyle?” Barbara Joye, a member of Metro Atlanta Democratic Socialists of America (DSA-Atlanta) told APN. “Trump’s policies will hurt almost everyone if anything like the proposed budget I have seen in Atlanta Progress News is implemented,” Joye said. Per Trump’s proposal, nearly every category of public program that helps people such as legal aid, consumer protection, transportation, environmental regulations, Head Start programs, social services, public housing, education, and the arts would be crippled or eliminated by Trump. Trump’s Cabinet nominations are the most extreme of the right-wing extremes, and the stated goal of many of them is to destroy the agencies they lead. “There are things happening in Washington that should not be happening. The people’s representation has been in lock-step with the administration to make major changes in our country that’s unconstitutional,” Dr. Rebecca Quigg who is running for U.S. Congress in the Sixth Congressional District, said to those gathered at the Arts Station. Dr. Quigg is shocked that former U.S. Rep.Tom Price (R-GA), a physician, tried to repeal the Affordable Care Act (ACA) over sixty times while in U.S. Congress and now heads up the U.S. Department of Health and Human Services. “We need a doctor in the House with a heart that cares about patients and cares about health care for all Americans. I’m not taking corporate money, we have to show Congress that corporations can’t buy public officials,” Dr. Quiegg said to loud applause. Others called for Trump to release his tax returns, and for a bipartisan committee to investigate the possibility of Russian hacking in our election process. “Trump has done a lot in the last few days to hurt the country and the world. We have to unite all races, genders, all nationalities and countries to remove him from office,” Alexander Vaughn a science teacher, told APN. As with so many others, this was Vaughn’s third protest and this is his first year to ever protest. Thanks again for excellent reporting. Valuable article for those who couldn’t participate. The Trump Administration is going to make the U. S. a wealthy nation by exploiting our inexpensive, abundant, and geographically distributed coal, oil, and natural gas. The Obama-Clinton people hobbled our energy supply and kept the nation’s economy in an economic malaise in spite of our great wealth. Those participating in these marches don’t know what they are doing and will be shown fools in a few years when the nation has the greatest economic boom in its history. Has anyone watched the stock market performance since Nov. 8? $2.3 trillion added to our wealth. More to go. And exactly what are the impeachable offenses the President has committed? Your post does not detail this and, until it does, is of no consequence. One can question the legitimacy of how the office was obtained without evidence, likewise one can question the legitimacy of the birthplace of one who has obtained the office, without evidence….circa production of a birth document…..6 years after the fact….